Picketers: Walmart’s raising wages, so why won’t Target? Demonstrators march outside Target’s headquarters on Nicollet Mall. Activists picketed outside Target Corp.’s headquarters downtown Minneapolis yesterday, calling on CEO Brian Cornell to make raising wages for frontline workers a part of the company’s massive restructuring effort. 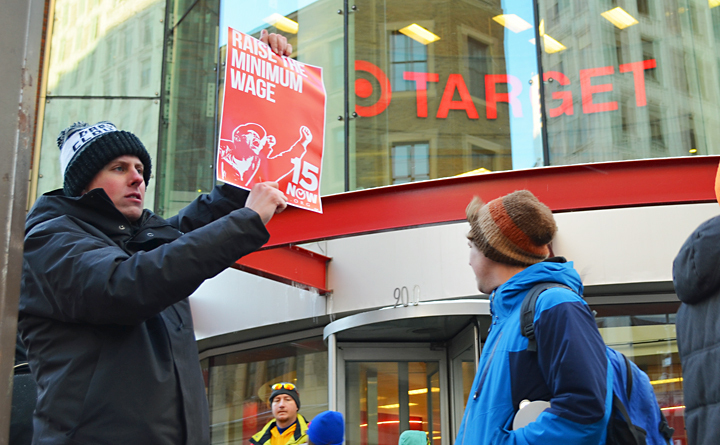 Organizers of 15 Now, a grassroots movement working to raise the minimum wage in Minneapolis, looked to pressure Target into following the lead of its primary competitor, Walmart, which announced plans last month to raise its workers’ wages to a $10 minimum by next year. The picket began at 4:30 p.m. and lasted about an hour. 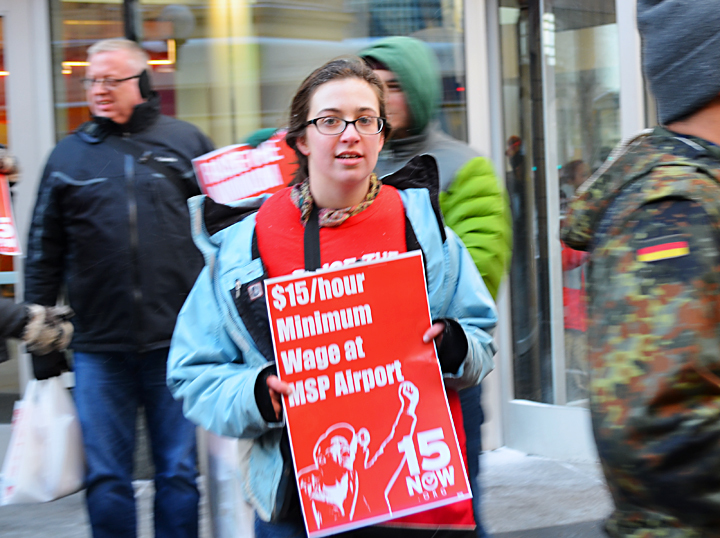 It drew more than 25 supporters, including members of the Minneapolis-based community group Neighborhoods Organizing for Change, which is backing 15 Now’s campaign to raise wages. Activists also used the event to respond to Mayor Betsy Hodges’ statement that she would not support an ordinance to raise the minimum wage in Minneapolis, favoring a regional or statewide solution instead. Kip Hedges, the former Delta Air Lines baggage handler fired for his support of 15 Now, found himself in unfamiliar territory, urging the mayor to be more like Walmart. The retailer’s decision to raise wages prompted several others, including Marshalls and T.J. Maxx, to follow suit. If Minneapolis raises its minimum wage, Hedges said, other cities will do the same. 15 Now plans a major action to ramp up its campaign in Minneapolis April 15. Monitor 15 Now Minnesota’s Facebook page for details.